This Welcome Flourish Coir Doormat is the quintessential mat that every home owner might want or need to dress up their front door step. The simple message of welcome along with the decorative flourish around the edge is perfect for inviting visitors into your home. Use this mat by itself or you can pair it with our Scrollwork Coir Tray for an upscale look. Coir doormats are a true staple when it comes to doormats. Made from naturally rugged & durable coconut husks and woven into a mat it gives a rugged and abrasive surface that is great for getting the shoes of your guests, friends and family clean before they come into your home. The natural coir coco fibers are very coarse and so offer an aggressive scraping surface but there are enough gaps between the fibers that the mat can catch the dirt and debris that is scrapped free. Made with natural renewable fibers for the eco conscious home owner. A stunning image transposed onto the outer surface of the Coir Mat. Easy to care for! Visit our Cleaning and Care Page for details. At a half inch thick this mat is made to last. A recycled rubber backing make it slip resistant. 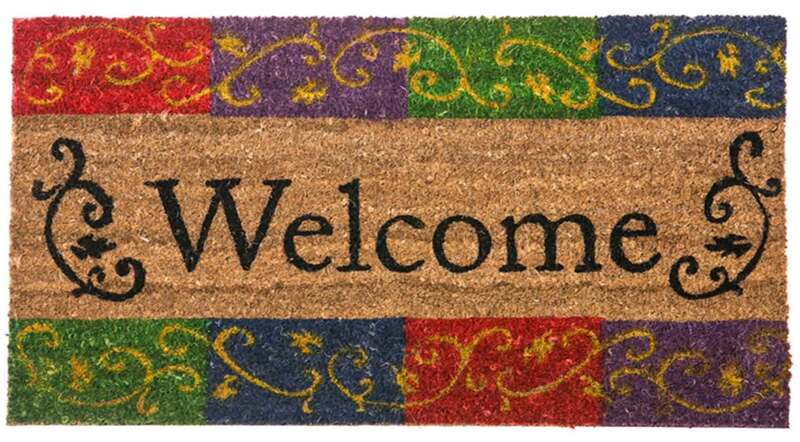 The Welcome Flourish coir mat is great addition to any home. 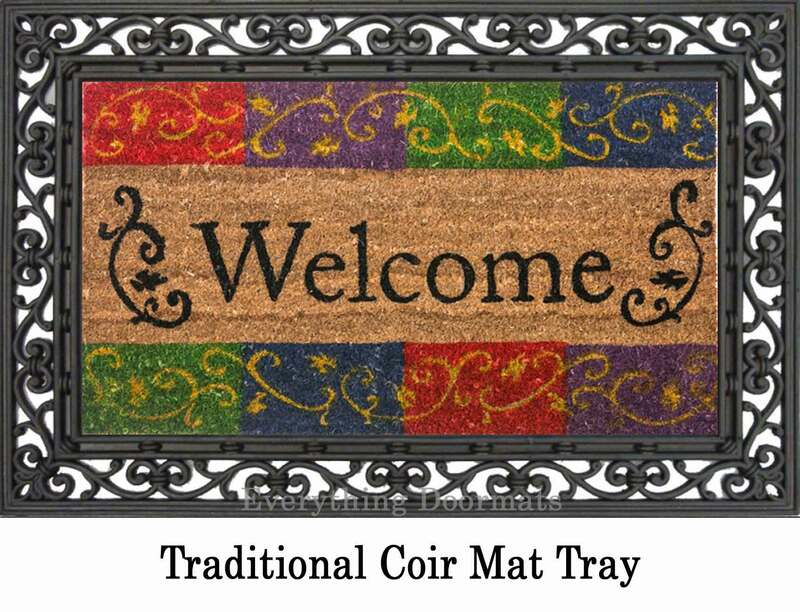 With actual dimensions of 15.5" x 27.5" x 1/2" this mat makes a great addition to any home's front porch.Pair it with one of our Coir Scrollwork trays for a mat with total dimensions of 24" x 35" x 5/8"
Note: The Flourish Welcom coir mat is pictured as both a stand alone mat and in our coir scrollwork tray. The Coir Scrollwork Coir Mat Tray is sold separately and can be added to your order in the drop down box above.